Behold, what thy swap meet hath wrought! Few art shows feature materials as offbeat as twigs, cake turntables, garlic root, fish stringers, and a swap meet ceramic pig--all while de-emphasizing the individual materials in favor of the completed product. # recycled materials, though environmentally friendly exhibits do seem to be gaining steam in San Luis Obispo County. A walk through Frame Works' second annual ArtEco Exhibit reveals that sustainable art can be aesthetic, serve a utilitarian purpose, and convey a greater message or perspective about the world. "We focused on really trying to maintain a high level of craftsmanship because there's such a stigma with recycled junk," said gallery director and artist Sara Egerer. "I don't want people to focus on what it's made of. I'd rather focus on what it's become." The Frame Works gallery, a small space that challenges exhibit coordinators to get creative when placing art, is filled mostly with metal pieces hanging from walls, fashioned into brooches, and supporting plants, though visitors can also find plenty of fabrics and wood in varying degrees from their natural state. Some of the materials--such as the pieces of trash cans that comprise Fred Pasion's Fred's Fish, the globes in Carol Paulsen's pieces, and the chair in Maggie Ragatz's Words are Blunt Instruments--are immediately recognizable. Others are only faintly traceable, vaguely resembling the culinary tools or railroad apparatus they once were. Eleven artists contributed to the Art Eco exhibit--many of them are featured artists from last year's show--and most of them are responsible for multiple pieces. Alfredo Arciniaga, Sara Egerer, Carol Paulsen, Fred Pasion, Don Pimentel, Stephen Plowman, and Nick Wilkinson all submitted sculptural pieces. Dawn Perry-Taft contributed a piece made from fiber, Kathy Metcalf made jewelry, Nancy Koren made a multimedia piece, and Maggie Ragatz's work was conceptual. The show marks the first occasion that Frame Works has submitted a call for artists. The framing business usually relies upon word of mouth and relationships with clients, but they were hoping to expand their pool for this particular green extravaganza. # Each piece says or does something different. Egerer's pieces include a functioning clock made from moulding scrap and a lamp from copper pipe and recycled paper. Metcalf's vintage-inspired jewelry is meant to be worn, jauntily and proudly, by anyone with an eye for distinctive accessories. And Stephen Plowman's Revisiting Eden series features three unique plant holders made from metal scraps. The largest of the three, holding eight different succulents and titled Revisiting Eden, E-mail, stands at a drunken angle, which can be readjusted. Some of the materials were fashioned to reveal a political, social, or artistic message. 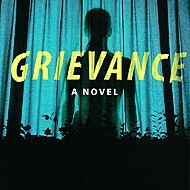 Ragatz's Words are Blunt Instruments features a large red sign with a command--"SIT"--above a small red chair. The piece is a play on conceptual artists who talk down to the viewer, issuing bold commands as social commentary. Ragatz's chair is, fittingly, the type you would find in a schoolroom or daycare, where children are routinely ordered to sit. 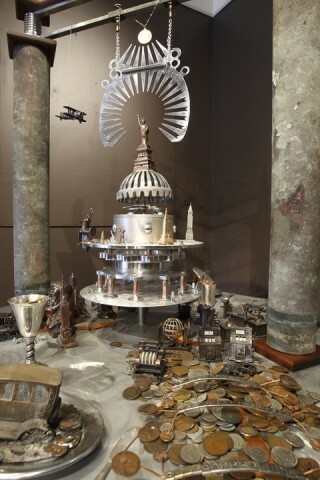 Egerer created a glittering shrine titled God of Opulence. 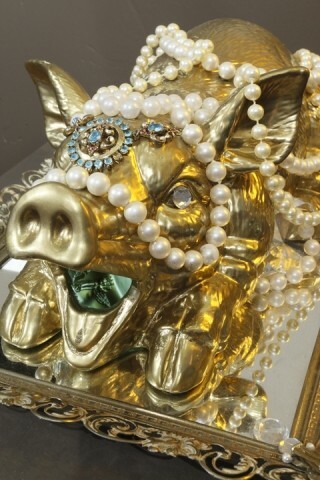 A golden pig sits on a gilded mirror, swathed in faux pearls and gemstones. When Egerer first found the pig, it was a demure white with flowers, but a layer of gold spray paint immediately transformed it. "The pig came from a swap meet," Egerer explained. "I started making gods because I like shrines, but not the religions associated with them." To reinforce her message about opulence, Egerer placed miniature skeletons inside the pig's belly as a representation of the sacrifice made to acquire the jewels. She currently has several other shrines in progress--like one to sedation--all of which play with the idea that culturally we have a limited definition of God, a perception that fails to address the objects we really worship. 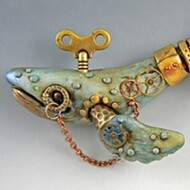 Still other pieces are purely aesthetic, like Fred's Fish, made from faucet knobs, trash cans, and license plates. The blue creature with a gaping orange mouth hangs from the ceiling--an unexpected catch. And Nancy Koren's web-site is a large tangle of string spun around twigs from her backyard mounted on a canvas of layered purple and yellow paint. "Beauty in Unexpected Places" might be a suitable alternate title for the show, given that trash can parts and twigs are rarely accorded any aesthetic value, but that's just one of the ways Art Eco allows people to re-envision everyday materials. Perhaps the most visually thrilling of the two dozen or so pieces is Don Pimentel's Pot Metal Empire, an eclectic, interactive table constructed on a golf display stand. The sculptural furniture is a treasure trove of unexpected items: A miniature Statue of Liberty crowns a three-layer-cake turntable framed by a fireplace grill that looks like metal teeth, giving the entire piece an oddly art-deco feel. Pimentel transplanted wings from a toy dragon onto the statue. The table also contains a miniature assembly line made from pencil sharpeners lined onto copper foil. The table is strewn with Monopoly figurines, and a tiny employee is half-consumed by a meat grinder. Beside one of the plates of industry rests a goblet full of Olympic coins. The cluttered, metallic giant is the product of years of work. "[Pimentel] really takes the found objects to a whole new level," Egerer said. "He re-moulds the found objects to fit what he's looking for. And the pieces tend to grow, constantly transforming. I think this table alone is enough reason to go to the swap meet every Sunday." Beyond the materials--and each piece's individual message--Frame Works has an overreaching goal for the exhibit. Twenty percent of the proceeds from each sale will be given to ECOSLO, and next year they will probably host a similar exhibit with new pieces and a fresh infusion of artistic creativity. But the underlying idea that recycled materials can be reclaimed and transformed will be the same. "These piece are really informed by the material," Egerer concluded. "It requires such creativity, such a willingness to explore. You know, what can I make with a giant eggbeater? I think it's an interesting dialogue that happens between the artist and the material." Art Eco will be on display at Frame Works, 339 Marsh St. in SLO, through Jan. 11. 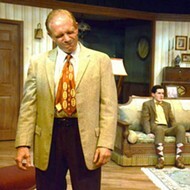 Twenty percent of the show's proceeds go to ECOSLO. 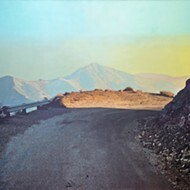 For more information, call 542-9000 or visit www.sloart.com. Arts Editor Ashley Schwellenbach is preparing to hibernate. 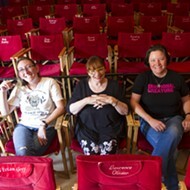 Send fattening snacks to aschwellenbach@newtimesslo.com.